Very rare reissue vinyl LP! A true collector's item! Japanese independent jazz label Atelier Sawano has been reissuing very rare vinyl LPs originally released by Tempo Records in Great Britain. 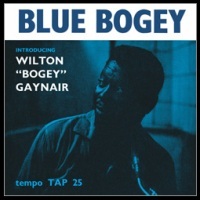 The fifth such reissue title is Blue Bogey by Jamaican tenor sax player, Wilton "Bogey" Gaynair. This album is so rare, that an original LP commands several thousand dollars in the used market. Wilton Gaynair (1927-1995) began his professional career playing in the clubs of Kingston, backing such notable visitors as George Shearing and Carmen McRae before travelling to Europe in 1955, deciding to base himself in Germany. He recorded only three times as a bandleader in his lifetime. Two of those recordings came during visits to England, the present album and 1960's Africa Calling, also recorded for Tempo but unreleased until 2005 on account of that label's demise. Gaynair's tenor style is unique: He has a fresh earthy tone, reminiscent of Sonny Rollins and Johnny Hodges at different times, and always emotionally straight forward. Thanks to the tender loving care of the people involved in this reissue project, the sound quality of this vinyl record is superb: Open, vivid, dynamic and detailed. Recommended for vinyl collectors! Originally produced by Tony Hall for the Tempo label. Recorded in England on August 26, 1959. This reissue vinyl LP (mono) was released in Japan by Atelier Sawano in April 2009. The CD version is available here.